Electronic cigarettes produce vapor, and the practice of inhaling and exhaling the vapor is called vaping. 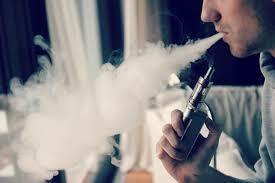 Also called vapor cigarettes or e-cigarettes, electronic cigarettes use battery to work like traditional cigarettes. The main difference is that they do not include tobacco and have a cartridge which contains nicotine and other chemicals. Those chemicals turn into steam or vapor when you use them. Many people think e-cigarettes are better than traditional cigarettes because they do not have any tobacco. Others believe that even vaping has its side effects, which could be as severe as causing cancer. Yes, it is possible to develop cancer because of vaping. That is mainly because the vapor of e-cigarettes can have cancer-causing formaldehyde. Some of these cigarettes have levels of formaldehyde 15 times higher than regular cigarettes. Formaldehyde, a colorless yet strong-smelling gas, is a human carcinogen and is usually used in glues and as an embalming fluid. When you operate e-cigarettes at high voltages, they are more likely to produce vapor with very large amounts of chemical compounds that contain formaldehyde. It means you are at an increased risk of developing cancer when you increase the voltage on your e-cigarette to get more vaporized nicotine. Does vaping cause cancer? It sure does. Even when you do not develop cancer, you may still have to deal with other side effects. You may develop dizziness or feel lightheaded when vaping, and that is mainly due to nicotine content of e-cigarettes. You are likely to deal with serious complications when ingesting high dosages of nicotine. The problem is that many people who engage in vaping lose track of how much nicotine they have already ingested in their systems. They sometimes find it difficult to stop vaping even when they start to feel dizzy or flush. Having clear information about your nicotine level is important when using e-cigarettes or else you will end up developing several issues. You may develop allergies or end up aggravating your allergies by vaping. The reason is that the e-liquid can contain different flavorings, including nuts, chocolate, fruits, or something you may be allergic to. You develop an allergic reaction when you use those e-cigarettes. Moreover, some people may also be allergic to vegetable glycerin or propylene glycol used in these cigarettes. You may develop canker sores when you fail to keep your mouthpiece clean after vaping. You have to put that cigarette in your mouth for a long time, so you are at an increased risk of developing an infection if you do not clean your mouth properly after vaping. Does vaping cause cancer? You already know the answer, and another common issue associated with vaping is dehydration. You usually develop it mainly because of the vegetable glycerin used in e-juice. While the issue is common, you can prevent it simply by having a glass of water after using your e-cigarette. Moreover, you are likely to develop a dry mouth mainly because the liquid contains propylene glycol which can hold water molecules in the mouth. You can develop a severe headache after vaping and that is mainly associated with the presence of propylene glycol. Some people are more likely to experience a headache while vaping, which is mainly because of their sensitivity to propylene glycol. Moreover, inhaling excessive nicotine may also make you feel headache. The fact that the FDA has not yet regulated e-cigarettes means they are not entirely safe. Since they are not regulated, they are likely to have several chemicals not suitable for you. Some manufacturers do not mind including some chemicals and materials that may do harm to some smokers. It is therefore important to spend some time learning more about vaporizer companies and make a choice while keeping their list of ingredients in mind. Most people opt for e-cigarettes because they want to quit smoking. However, this becomes a lot more difficult considering e-liquid still contains nicotine. Many people stick to e-cigarettes but use too much of it, which in turn increases nicotine levels in the body. This offers no benefits in terms of quitting because your body is still getting enough nicotine. Does vaping cause cancer? Yes, it may cause cancer, and you may even get hurt from explosion. One rare yet possible issue associated with e-cigarettes is that they may explode. This happens because they have a lithium-ion battery included in the device. These batteries can explode due to overheating, which could happen when they come near heat sources like direct sunlight. Overcharging and short circuits may also cause an explosion. E-cigarettes have a seal at the end of the battery that can rupture and increase pressure inside the cylinder, which in turn can lead to an explosion.